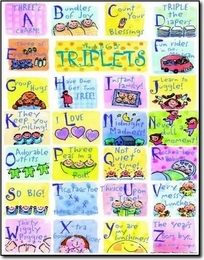 ABC of Triplets Print 11" x 14"
One of our best sellers! A unique and adorable nursery print for triplets! A - Three's A Charm! H - Have one, Get Two Free! T - Tic-Tac-toe,Three in a Row!